Africa University (AU) hosted representatives from three local councils in Zimbabwe namely Mutare, Chipinge and Rusape at an inception consultative meeting for a partnership geared towards leveraging research and expertise to strengthen service delivery extended to end-users by the local councils. The meeting took place on the 12th of September 2017 at University’s main campus in Mutare. Speaking at the event, AU Registrar, Mr. Herbert Njonga, highlighted that partnership between Universities and Local Councils was initiated by the Government of Zimbabwe, through the Ministry of Higher and Tertiary Education, Science & Technology Development together with the Ministry of Local Government and Urban Development. It stems from the Ministry’s view that collaboration between universities and local authorities can improve performance and service delivery to consumers. Mr. Njonga said that the University’s role in the partnership will be enhanced through the utilization of the University’s innovation and business incubation hub. “The Innovation Hub is a center of excellence that will facilitate and accelerate the development and commercialization of high-impact solutions to meet the ever growing needs of transforming the African continent.” said Mr. Njonga. Mr. Nyahangare who is the Interim Director in the Office of Research and Outreach Programmes at AU said the University approaches the partnership at equal footing with the local authorities. “Our approach to this partnership is for joint problem solving through collaboration. The university looks forward to learning from urban councils and the general citizenry the same way they would leverage on our research outcomes to improve service delivery from the local authorities .” said Mr. Nyahangare. The consultative visit led to the formulation of an integrated steering committee comprising of strategic stakeholders within the University’s leadership and that of the local councils in key thematic areas of action. The roll out plan involves specific thematic areas that will be explored including water supply and management, waste disposal management, information and data management, infrastructure development, customer service, leadership development and stakeholder engagement. The AU team are to carry out site visits to the three urban councils to conduct baseline needs assessments. The representatives of the urban councils indicated that capacity building and culture change initiatives are low hanging fruit which the university will be able to assist on. 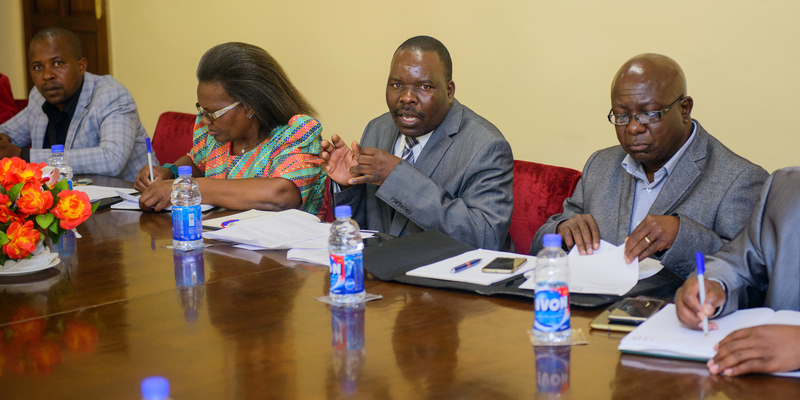 The partnership between AU and the three local councils is a direct response to the Government of Zimbabwe’s drive for universities to play a more direct and active role in social and economic development in Zimbabwe. In this new dispensation, universities are challenged to utilize research, expertise, technology, innovations and collaborations to generate solutions to meet the needs of end users at a sustained level to positively impact the economy’s bottom line.